There's an urgent need to build more and better apartments: to relieve an acute shortage of affordable housing in major cities; to use scarce land more economically; to save energy wasted on long-distance commutes; and to revitalize urban centers. These challenges have led to the creation of some of the most inventive contemporary buildings of the last few years. 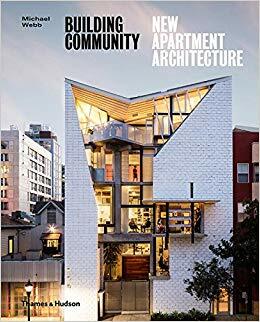 In his new book Building Community, author Michael Webb explores apartment buildings as a typology of growing significance and traces the history of multiple-occupancy housing through its most innovative 20th-century exemplars. These range from the pioneering projects of Henri Sauvage and Michel de Klerk to the landscaped housing estates of Weimar Germany, the radical proposals of Le Corbusier, and public housing in post-war Europe. Thirty recent apartment complexes are grouped by theme, from compact urban villages to mega-structures, and from social housing to upscale high-rises. Each is considered for the way in which it enriches the lives of residents and the city, and is illustrated with drawings and photographs. Nine projects currently under construction anticipate the surge of innovation as architects become increasingly involved in this area of design. Creativity is the theme that links these diversified examples: finding new ways to share space, while maintaining a balance of privacy and community. BuildingCommunity offers dozens of proven successes, offering valuable lessons in the creation of good living environments. It also includes interviews with Bjarke Ingels, Édouard François, Michael Maltzan, Lorcan O'Herlihy and Stanley Saitowitz: architects who have each set an example for their peers.